A green roof is a multi-layered roof system that is literally covered in soil and vegetation. The waterproofing and root-repellent membranes, along with drainage and filtering layers allow select plants to grow atop a building providing a myriad of benefits. Such benefits include: stormwater management; added building insulation and moderation of indoor temperatures; sound reduction; extended lifespan of roof membrane; savings in heating and cooling costs; aesthetic appeal; creation of habitat for birds, bees and butterflies; reduction of heat-island effect in cities; and improved air quality due to filtration of airborne particulates and carbon dioxide/oxygen exchange by plants. A green roof can be installed as either a modular system where all of the layers are pre-assembled into movable, interlocking grids or where each component of the system is installed separately. Vegetation varies from native plants and flowers to food and herb crops. Green roofs have frequently been used successfully in Europe for centuries. They are beginning to catch on here in the U.S. due to their numerous advantages. 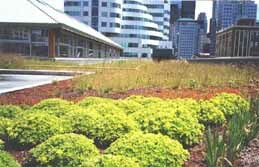 For those buildings seeking LEED certification through the U.S. Green Building Council, the use of a green roof system can provide several LEED credits. Training courses in green roof design for building professionals are offered by greenroofs.org. I think this is a great idea because when the land was taken by the bigger cities it left alot of the area without as many crops. I think also, the tops of buildings are not being used any way(especially schools)it would be a great place to keep the air clean.